These are 5 very rare and beautiful matryoshka dolls painted in a manner of Severodvinsk, a city in the Arctic Circle in Northern Russia. This set is brand new, made in Russia, and is signed on the bottom by the artist. The faces and aprons of these dolls are a beautiful natural wood with red, green and yellow trim. The dolls are blonde haired with delicate curls. Their cheery faces have just a hint of rosy pink cheeks, bright cheerful eyes and full red lips. Even the face on the tiniest doll is quite detailed. Each doll is carefully turned on a lathe out of a branch of linden wood, then hand-painted, and lacquered. 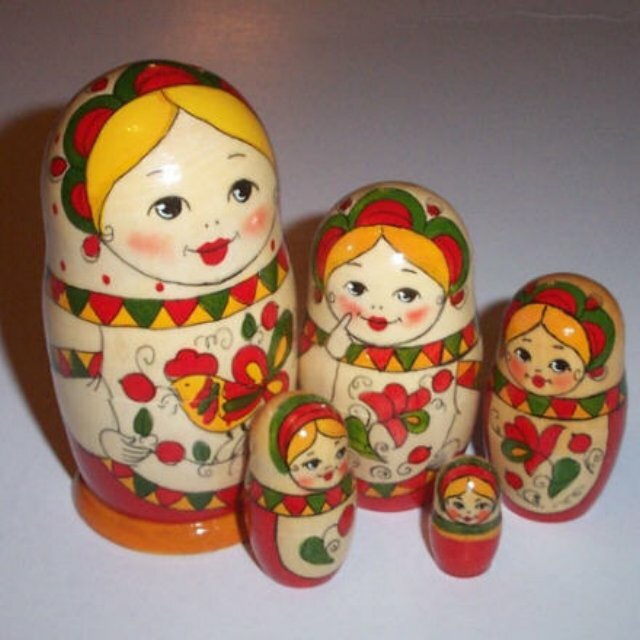 The big matryoshka is 5.25" tall and has a rooster on her apron. The other dolls are 3.5", 2.5", 2.25" and just over 1.25" tall.